Emotion filled the air as crowds went crazy during President Barack Obama’s second Inauguration. About 800,000 people packed the area surrounding the National Mall. There were into six ticked areas closest to the Capitol building. Non-ticket holders had to file in behind the secured areas. Beverly Morgan was one of the many people milling on a grassy area long after President Obama gave a final wave and headed inside after the roughly hour long ceremony. The California resident was bundled up in a multicolored scarf. Her earringswere small chains with President Obama’s face at the bottom. They jingled as she talked about how she didn’t want to miss the Inauguration. “I still consider this to be a very historical event in our society and I wanted to be a part of it,” Morgan explained. Attendees watched the event unfold across big television Jumbotron screens. 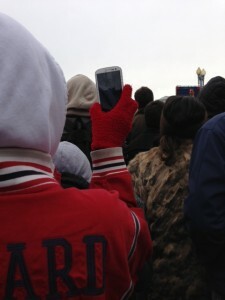 Cheers of “Obama, Obama!” rang out throughout the ceremony as people clapped with gloved hands during his speech. The crowd was a sea of cell phones as people continuously snapped photos, capturing a moment in history. Don Martin came from Toledo, Ohio and he looked toward the Capitol building with a steady gaze. He is a former Obama campaign worker, and he was pleased to see that his hours of making phone calls and passing out fliers had paid off.